We’re committed to improving uberPOOL. That’s why we’ve introduced a new pickup and dropoff experience called Express POOL, designed to make routes more direct and the experience less stressful for drivers like you. You’ll earn the same rates, and issues out of your control won’t affect your driver rating. We know it can be frustrating when you have to loop around the block, so with Express POOL, riders walk to you. Instead of picking up each rider at the door, Express POOL riders choose to walk to meet you at a spot along the route. Dropoffs work similarly. With Express POOL, riders choose to get dropped off at a spot near their final destination and walk the rest of the way. 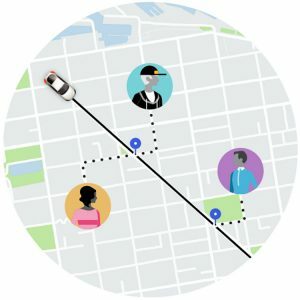 If a rider requests Express POOL, you’ll see in your app that they’ve chosen to walk to and from the pickup and dropoff. Walking allows routes to be more direct, so you can make quick, easy stops along the way and spend less time driving in circles. 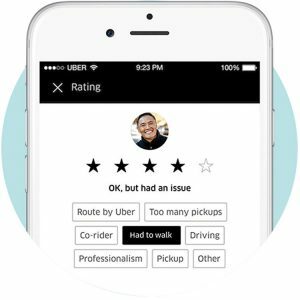 If a rider rates a trip under 5 stars, they’ll be required to select a reason why. If the reason is something out of your control, like a problem with Express POOL, the rating will be excluded from your overall rating. In addition, we’ll continue to exclude low ratings from riders who consistently give lower ratings. With Express POOL, you’ll earn the flat fare for every added pickup stop, in addition to your usual POOL rates. Each leg of your POOL trip will count toward your promotions.